A lot was (and is, as I type!) going on in the skies conjunction-wise. At this very moment the Pleiades, the Moon and Mercury have lined up in the dusk as pictures taken in the past hours from Europe like quite a number here and also this one and this one document (when dusk reaches the Americas, the Moon will already be above the Pleiades). Also earlier pictures of Mercury with the Pleiades on the 25th from the U.S. and on the 22nd, 21st and 19th as well as with resolved detail on the surface on the 18th. Before the Moon came round the Sun it occulted Venus for the Americas, be it grazing or fully as in fine picture series here and here or in this video. More pictures here and here and in collections here and here and here. Also the Moon in hi-res on the 23rd, with Venus on the 22nd from Germany and with Jupiter, Venus & Mars on the 20th from Oz. Plus Jupiter in hi-res on the 23rd and 16th + 17th, old Jupiters from Namibia - and the question why Uranus' rings are to hard to image with amateur gear. 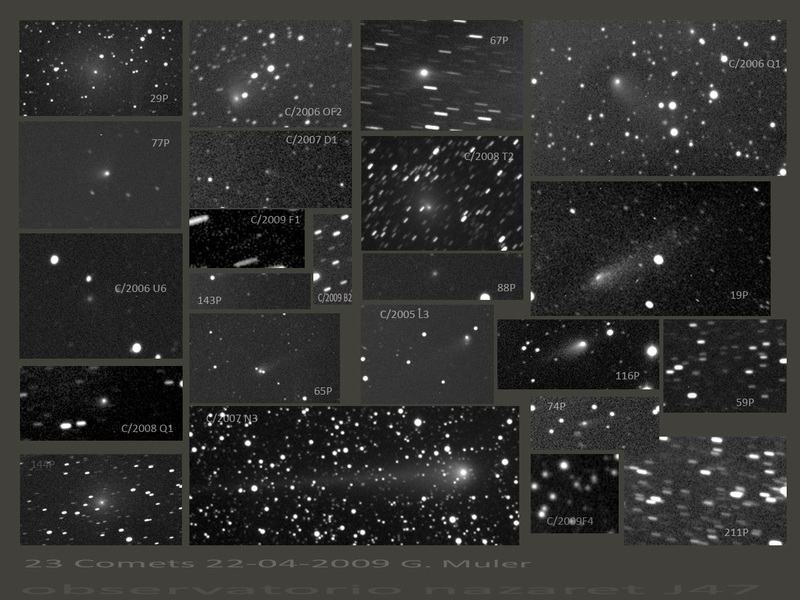 In other news avid cometographers managed to capture 23 comets in one night (of April 22) or 16 in another (of April 25)! Lulin is still around, e.g. on April 22, an old McNaught showed an interesting tail on April 19, and we have Borrelly on the 22nd, Chury on the 15th and Cardinal at M 36 on the 17th. • The Lyrids reached a maximum ZHR of around 15 - about typical - at the predicted time, though there's an other, later ZHR=30 peak in the automatic plot right now. There are now 11 new meteor showers in the Working List, most also confirmed by the IMO video network. Also of interest are fireballs on April 22 (not a Lyrid) and April 17 and a "mystery rock" which may or may not be a meteorite. • There is increasing talk about the meaning of the ongoing deep minimum of solar activity (and the non-role of the Sun in Global Warming), also here, here, here, here, here, here, here and here (a video interview). • We have a better lightcurve of IY Uma, an eclipsing central star of a planetary nebula, the SN in NGC 4088 (and a nice picture of M 88). • Finally some light pollution calculations - and an overview of cameras in orbit looking at the Earth and delivering live image feeds. It's rare to have a supernova brighter than 15th or 16th magnitude, so SN 2009dd in NGC 4088 in UMa which has about 13.5 mag. is something special. Here are one of the discovery images (the SN was found independently by two Italian teams), a picture taken soon thereafter by a German amateur (before the SN even had a number) and a nice picture of the galaxy itself. SN 2009dd has the typical spectrum of a young type II supernova, a few days after its explosion - which took place some time between April 2 and 4 as Japanese images (found later) show. • In other variable star news, an outburst of IY UMa is underway and a variable in a planetary nebula and a transit of exoplanet XO-1b have been observed. • In the current deep solar minimum even coronal mass ejections are slower than typical (while their 3D structure is clearer now thanks to STEREO). Also a prominence video, an asteroid named after the last total solar eclipse or rather a prime viewing spot in China, and why there will be no tsunami following the next TSE. • An unusually deep wide-field sky image with 40 hours of exposure time is causing attention. • A fine Jupiter from down-under, a nice Saturn with Rhea's shadow on the disk and a table of Titan transits - of which not a single one will be visible in Europe. • Did Venus' atmosphere show a closed ring during inferior conjunction or at least arcs all around as this picture may indicate? The Japanese archive has nothing similar, though nearly closed rings were detected 2 days before the last transit of Venus (the exact time and a somewhat later image). Meanwhile here is Venus on April 11. • More bolides, in Austria on April 9 and in California on April 7. • The Field Museum has received a lot of meteorites while the largest one in Texas has been found and the videographer honored who taped the bolide, a call for searchers in Canada is out w.r.t. last year's meteorite rain - and sometimes dogs make good hunters for meteorites! 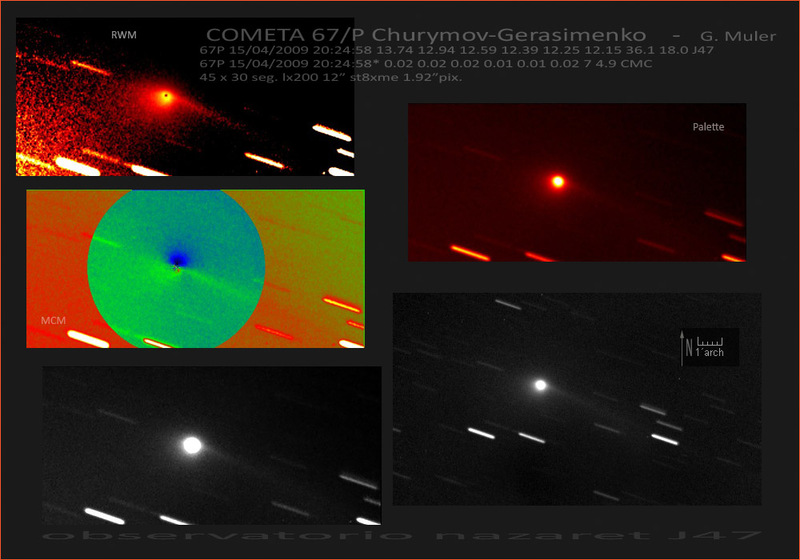 • There is another comet discovery with the STEREO spacecraft by an amateur, though the comet is less interesting per se than Yi-SWAN (more stories here and here and pics of April 12 and April 9 and more). 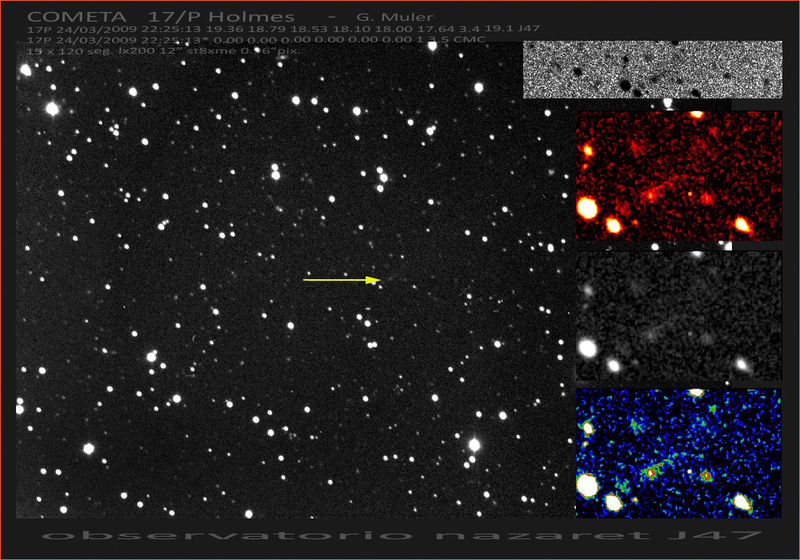 • Also Cardinal at M 38 (more), the recovery of an old LINEAR and 19P on April 12. The same says it all: C/2009 F6 (Yi-SWAN), pretty bright around 8th mag., was found simultaneously by a Korean amateur astronomer and the SWAN instrument on the SOHO spacecraft (which reported it first, but Yi's message came in before the first orbit was published, thus the double name). "On Apr. 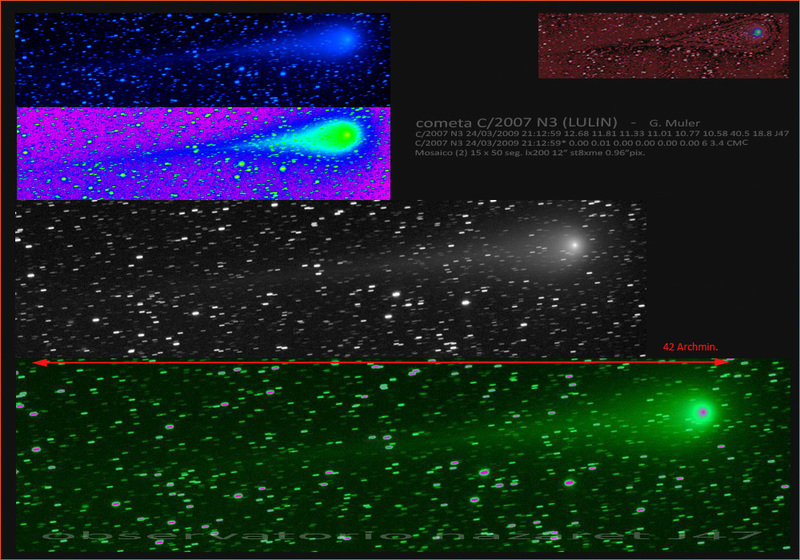 4, R. D. Matson informed the Central Bureau that he had found a possible comet on ultraviolet SWAN images posted at the SOHO website," the story began on April 6 in IAUC #9034: " Numerous CCD astrometrists and one visual observer have reported confirmation of the object as a comet". And in #9035 we learn today that H. Yamaoka, Kyushu University, informs the Central Bureau that he received an e-mailed report on March 28 of the discovery by Dae-am Yi (Yeongwol-kun, Gangwon-do, Korea) of a possible comet with a noticeable greenish coma of diameter about 1' [...] on two 60-s CCD exposures taken about 80 seconds apart with a Canon 5D camera and a 90-mm f/2.8 camera lens. Orbital calculations suggest that this object is identical with C/2009 F6." Visual estimates put Yi-SWAN at 8.5 mag. 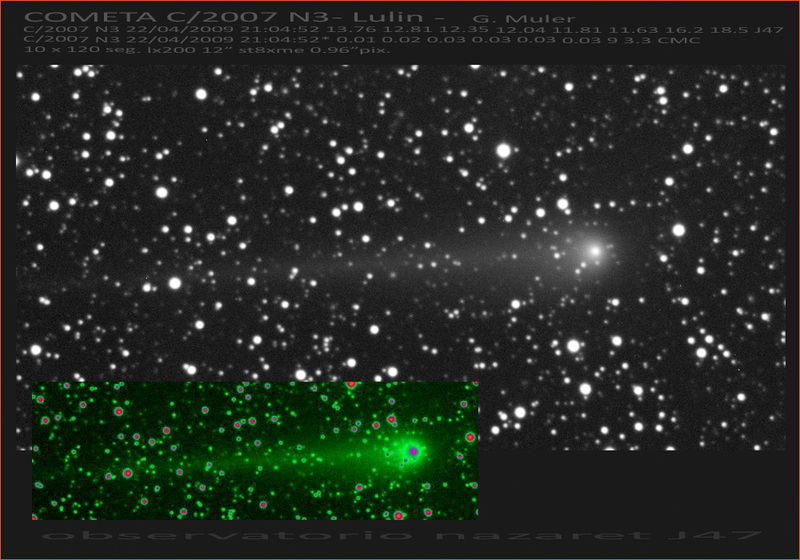 right now, and the orbit suggests that this is about as bright as this comet will get; an ion tail has been detected. Another detection on March 25 was only made after the discovery announcement, thus it doesn't count. 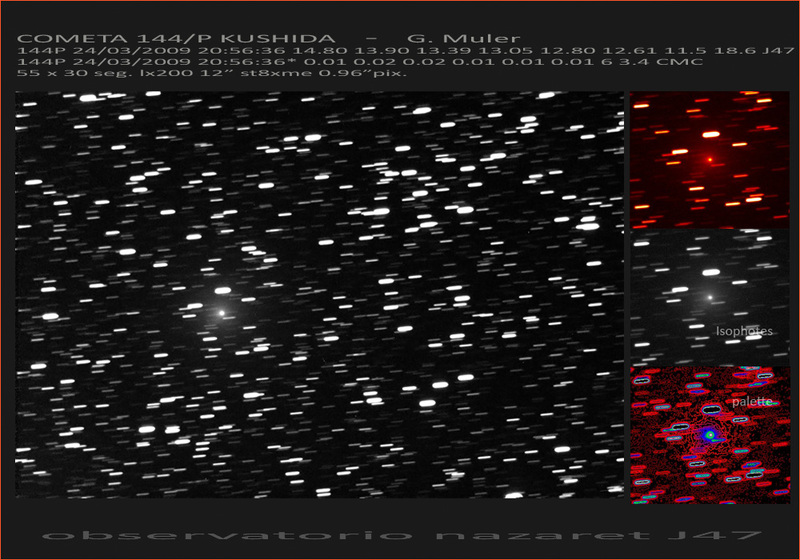 In other small bodies news we have scientific papers about Spitzer observations of 67P (a current picture and more) and ground-based data on 17P/Holmes' outburst (also a current view), interesting developments of 19P, the recovery of P/2001 MD7, an old - but nice - picture of Kushida in the Hyades (a current picture and more) and Lulin on March 28 and March 24 (another picture) as well as its changes. 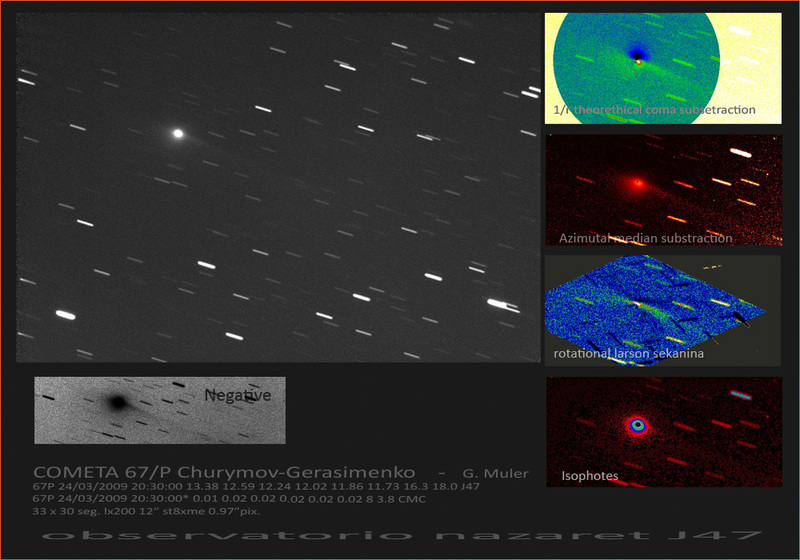 Plus 4 comets on March 25. • In the Kuiper Belt, the moon of Orcus has been named Vanth; more interesting than the name is the fact that over 1000 suggestions had come in after the discoverer asked for suggestions. • There was another big bolide in Northern Ireland (more, more and more coverage) and one in Virginia which caused a lot of confusion at first (more, more, more, more, more [earlier], more, more [earlier], more and more). • The recovery of the (only one!) meteorite from the baltic bolide is recounted by the discoverer himself who also explained at a German meteor meeting how he found the shattered specimen in the grass and what it was like. At the same meeting a microbarometric signal from the exploding bolide was also shown, recorded with a machine like this - which is enormously sensitive! 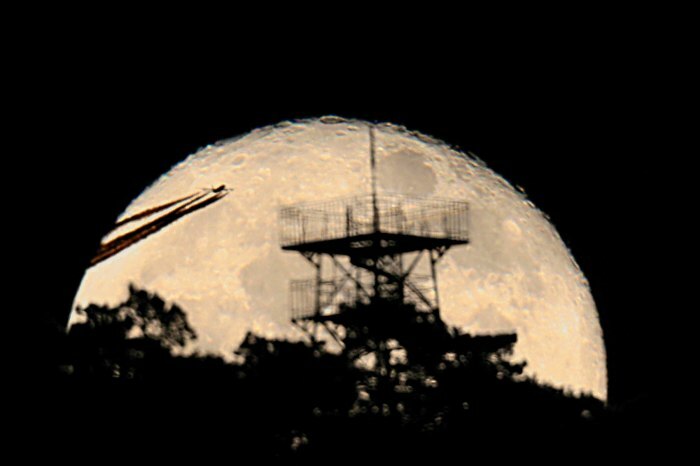 Yet another "dimension" of amateur astronomy has thus opened up. In other news The solar activity remains low, making the current minimum rather deep, with no end in sight. • By the way, some STEREO images from the time of the last total solar eclipse. • Here is the slender crescent of Venus on April 5, April 2, March 28 and March 26 - and the inferior conjunction was also used by radio hams to get echoes from the surface with a big dish in Bochum (as a demonstration experiment for a possible future use of the latter in controlling an amateur mars spacecraft, no kidding). • Here are Saturn & six moons and the small storm on March 21. • And here is Jupiter with Io's shadow. April 8: Birkat Ha-Hammah or "Blessing of the Sun", a rare 'phenomenon' in some branches of Judaism where the alleged return of the Sun to its celestial position at creation time is marked only every 28 years. About April 9 til May 2: Best evening apparition of Mercury, now almost fully illuminated, with the half phase and greatest elongation on April 22 and 26, resp. April 15: Very close conjunction of Mars and Uranus, low over the Eastern horizon. April 21/22: In the morning peak of the Lyrid meteors. April 22: The Moon occults Venus for most of North America. April 24: "The position of the Sun and the shape of the Earth" - a worldwide didactical experiment employing elementary techniques. Join the party! 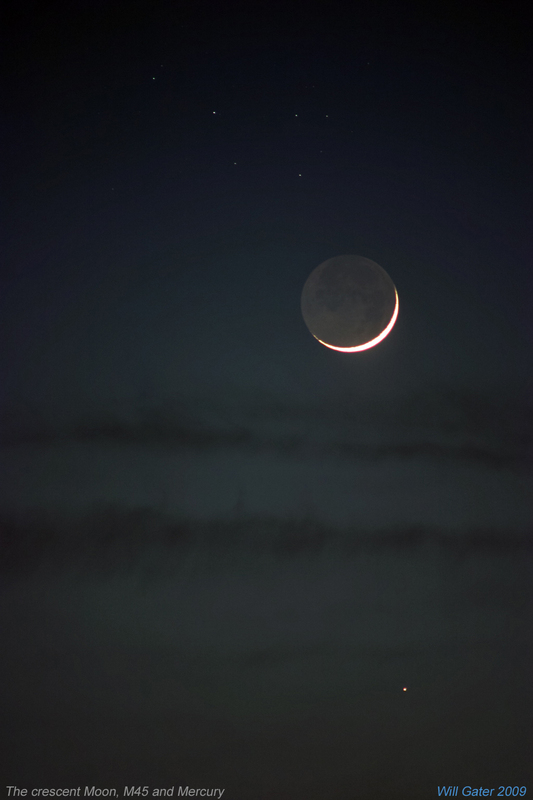 April 26: Line-up of the lunar crescent, the Pleiades and Mercury in the evening.